In case you missed it, yesterday was part one of my cloth diapering discussion, where I addressed why we cloth diaper, what the initial set up looks like, diapering the first 6-8 months, and how cloth diapers impact laundry. The whole post can be read here. Today, I’ll be talking about all the diapers we’ve tried since Nora was 8 months old and what works/doesn’t work. Once Nora was getting close to outgrowing her Snugglebottoms (size small fits up to 16lbs), I knew we had to make a decision about what the second phase of diapering would look like. There were no stores in our area that sold Snugglebottoms (and the mama who sold me the smalls was still using her larges), so we bought a few Kissaluv contours from Waddle n Swaddle in Poughkeepsie. This setup was very similar to what we were doing, with an absorbent diaper and a waterproof cover that holds it in place. The Kissaluvs have an extra absorbent pad sewn into them (called a soaker or doubler), which the Snugglebottoms did not have. We bought a size medium/large which fits 15-30 lbs and should fit her through the end of diapering, but could be outgrown by a bigger toddler. These diapers work fine. They are also cheap – colored ones retail for $7.95 each and plain for $6.95. Add a few Bummis covers for about $12 and you’re ready to diaper. But, ultimately, I decided not to go this route, and I tend to use these as back up diapers, for two reasons: first, they are bulky – some of her pants (jeans, mostly) cannot be worn when she’s wearing these – and, second, as she got wigglier, it was harder and harder to put on a two-part diaper. After I realized we didn’t want to stick with contoured diapers and separate covers, I bought some new GroVia Hybrid diapers. These are a one-size (meaning they fit baby-toddler) waterproof shell with a 100% organic cotton soaker pad. I really liked the fact that they were organic cotton rather than man-made fabric. Also, it seemed like a cheaper alternative to some of the diapers I’ll talk about further down in the post – the shell can be reused if the diaper is only wet, so you only have to buy a few $25 shells and then just buy a bunch of soaker pads ($17 for 2). However, once I started using them, there were two things that kept me from going back to buy more: the snaps which hold the soaker in place mean you have to touch a wet or dirty diaper to get it out of the shell (all of our other diapers could be shaken from the cover into the diaper pail without getting on my hands) and the cotton, while very absorbent, takes forever to dry in my dryer (they need full heat and an 80 minute cycle, which costs money and wastes electricity). About the time that I was hemming and hawing about buying more new GroVias, I was able to buy some used diapers from a friend. For $35, she sold me the following: One Thirsties Fab Fitted diaper and cover. This is a two-part diaper and is also sized (it’s a medium which fits 18-28 lbs). Obviously since I only have one, I’ve never diapered full time in it, but this is a nice cheaper alternative. The diaper is much trimmer than the contours (I.e. she can wear jeans) but just as, if not more, absorbent. 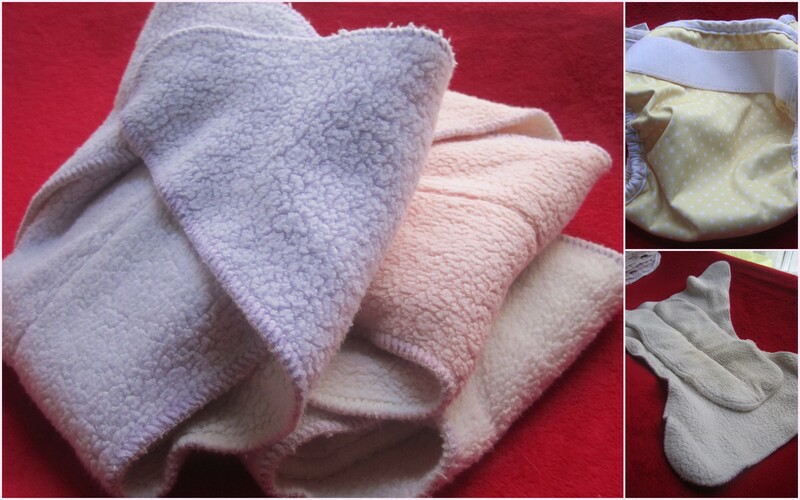 It’s made of microfleece rather than cotton. Because it velcros, it’s less complicated to put on a wiggly baby and the cover is only for waterproofing, rather than holding the diaper on. The Thirsties cover works fine, but I prefer Bummies for some unknown reason… Three All-in-One diapers. 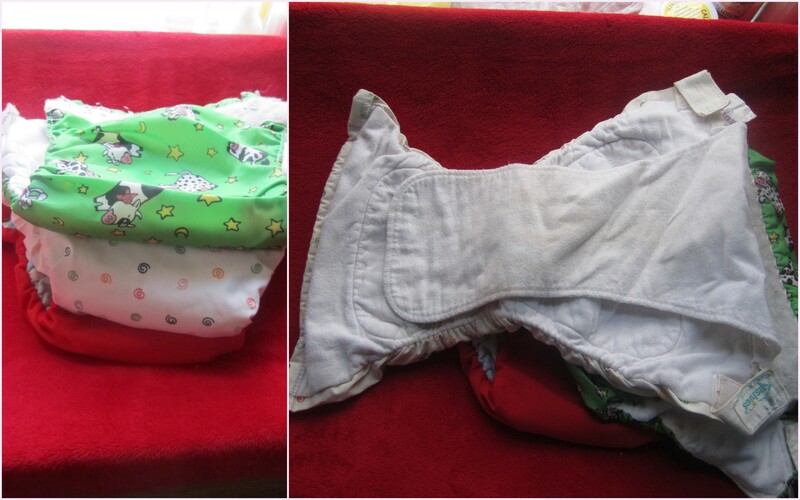 There’s one Kushies Ulta-Washable Diaper, one Bumkins All-in-One Diaper, and one homemade AIO. An all-in-one diaper is just that – it’s one piece that is both absorbent and waterproof. It’s the closest you can get to a disposable experience while using cloth, and super convenient. There are downsides to AIOs, though. Most of them are sized, which means you need several full sets, and they are expensive – one Bumkins costs $20-25. 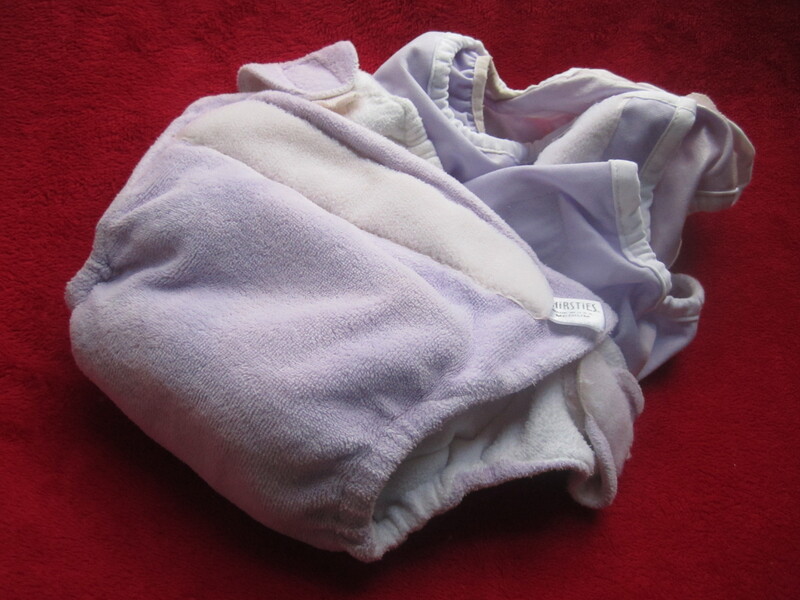 Also, it seems like it takes them a long time to dry – even after a full day out in the sun, I had to throw them in the dryer, which was not the case with our microfiber diapers. I’m also a little bit concerned about the long-term effects of a dryer on the waterproof outer layer. As far as the two brands go, I can’t really see a difference between the Kushies and the Bumkins; both have 6 layers of cotton for absorbency and neither have leaked. I’ll admit that we don’t use these much, though, and if we do I usually throw one of my microfiber doublers in it. I anticipate using these more as we get closer to potty training, but they are all still a little bit too big for Nora. And six BumGenius One-Size Pocket Diapers. As it turns out, pocket diapers are my favorite type of diaper. 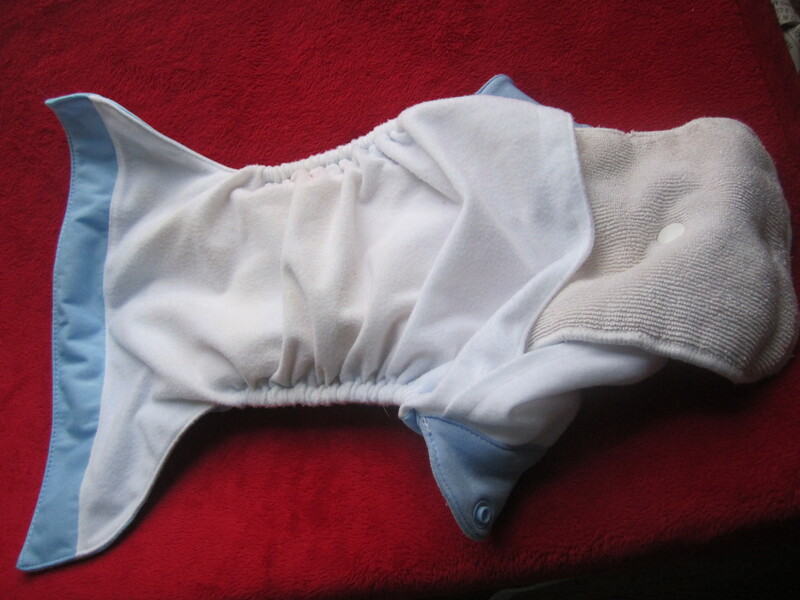 Pocket diapers consist of a cover with a microfleece lining, into which an absorbent insert is stuffed. They have the convenience of an AIO, but decreased drying time and the possibility of extra absorbency (because you can stuff anything in there!). We have two brands of pocket diapers, the BumGenius and Tiny Tush (I bought more new after trying the ones from my friend). There are minor differences between the two. Both came with a microfiber insert and doubler. The BumGenius insert can be snapped down to fit a smaller adjusted diaper, whereas the Tiny Tush doubler serves as the infant insert (meaning it, when combined with the main insert, is more absorbent than the BumGenius insert and doubler). Becasue these are one-size diapers, they can be sized with the snaps on front to fit (almost) newborn through toddler. Another big difference between the two (until BumGenius’ recent 4.0 version) was that BumGenius diapers had Velcro closures whereas Tiny Tush had snaps. Now both have snaps. Initially, both Chris and I preferred Velcro because it just seemed easier and like it might be more adjustable in size; I am now a huge advocate for snaps. All of our snap diapers are in much, much better condition than the Velcro. Over time the Velcro will curl and lose its adhesiveness; if you’re looking for longevity, snaps are the way to go. In general, I’d recommend Tiny Tush over BumGenius; though the snap-vs-velcro issue is gone, I prefer the way the Tiny Tush pocket is sewn and they are made in the US. But, they are about $1-2 more and new pocket diapers will run about $17-18 apiece. And that, folks, is our current crazy stash of diapers. All together we have about 30 diapers which last 2-3 days (some of them don’t get used except on a rare occasion) and cost us about $150 (for a total lifetime diaper cost of $350, if combined with yesterday’s total). Mostly, we diaper Nora during the day in GroVia and at night in a BumGenius or Tiny Tush. If I had to pick just one diaper, it would probably be a one-sized pocket diaper, but there are a lot of factors to consider (budget, fabric/materials, convenience, etc.) so that might not be the right choice for you. I hope this was a helpful two days. I’d be happy to answer any questions about cloth diapering or our diapers. I’d also love to hear from other cloth diapering mamas – is there something you would like to share about doing it? Do you have a favorite diaper we should know about? The snap diapers that size up are also great for the potty training and Night time only stage. You need something that they (and you) can easily pull up and down like underwear. Either the all in one’s or the pocket diapers work fine for this. Awesome post Amber! It sounds like there hasn’t been anything that just absolutely doesn’t work. Do you think that plain old Gerber flat-folds would work with a diaper cover? It also seems like you could sew your own inserts, soakers, etc. for way cheaper than it costs to buy them, used or new. I’ve been looking around on ebay, I think I can get 24 brand-new one-size pocket diapers with inserts for $100. Do you think the one-size style would be super bulky on an infant? I’m going to print out these posts for future reference. Thanks for taking the time to share with the rest of us! You’re right, they all work. I haven’t ever had a cloth diaper experience (with any type of diaper) that’s as bad as some of the disposable blowouts I’ve experienced. So it just gets nit-picky about little things. The not being able to wear certain pants with really bulky diapers is definitely my biggest pet peeve and the closest I might come to a deal breaker. I’m not sure about the Gerber. I think they’re only 6-ply and most other diapers are 9? I think I remember hearing that they weren’t absorbent enough. You definitely could sew your own, though. That’s how a lot of the diaper companies got started. 🙂 You could even make your own covers, but I bet that would be more trouble than it’s worth. I actually had on bumgenius and one tiny tush that I occasionally used on Nora when she was a newborn. It was bulky, but not too much. Their clothes are much looser then anyway. Check the one-sizes that you buy, though. Some of them don’t start until 8 or 9 lbs. We had to use disposables for the first two or three weeks because Nora was too tiny for our diapers. I think that’s why a lot of people have a set for newborns and then a set for 3 months and up. Also, you’ll need a lot of diapers at the newborn stage. If a baby is getting enough breastmilk, he’ll have 8-12 wet diapers a day. Plus one or more poopy diapers. (My understanding is that this can be more with formula because they end up drinking more water). 24 might not be enough for a newborn to go two full days. But, $100 isn’t bad at all and they’ll fit through the end. By the way, did you see the comment Mary posted on the last post? She convinced her daycare to use cloth. I heart you forever. my aunt offered a while back to set us up with cloths and I’m serriously considering taking her up on that offer. Hey Amber, I love your cloth diaper post! I just wanted to throw in that we use mostly grovia (although we have only the older grobaby version) diapers here and I’ve found that the bummies prefolds work great in the grovia covers. They stay put and don’t bunch up. This was a great discovery since I got 2 packs of bummies prefolds at my baby shower and only 1 small bummies cover. I’m not a huge fan of the bummies or thirsties covers so it works all around for us! We didn’t get into cloth until Addie was 4-5 months. She was so tiny until then 11-12lbs that I hated the way all the cloth diapers we tried fit on her. Now that we cloth full time, I’m looking into better ways to cloth a newborn. I’ll already be washing Addie’s diapers I’m dreading going back to disposables. I think the one size xs, s is gonna be the way to go.